In my senior year of high school I was given the award for the “Most Improved Varsity Wrestler.” I earned the award because in my junior year I had a losing record as a varsity wrestler. Most of the matches were close but I came out on the losing end of the matches more often than winning. In my senior year I miraculously turned things around, losing only one match during the regular season. I took 2nd in the county championships, became the regional champion and finished 4th in the entire state. A remarkable turnaround! It was, however, years before I recognized the main reason I had accomplished such a turnaround. The reason for my success was tied to the fact that my wrestling partner most of the year was a lowly sophomore who was bold, brash, and cut from the same cloth as a Mohammed Ali. 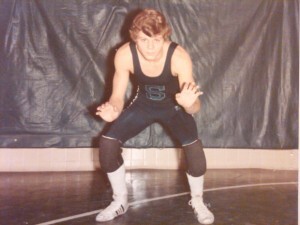 He arrived at the school and word quickly circulated that he was bragging around school that he could beat anyone of us on the wrestling team. We seniors didn’t take kindly to his bragging. When wrestling season started I didn’t like him because of his brashness but when the coach told us to work together for the entire year I knew I needed to change my attitude. It wasn’t long before I became friends with Loran and we forged a friendship. He and I wrestled everyday together, often harder than the others. We took each other seriously and we never wanted to let the other get the upper hand in practice. I was reminded of Loran when I visited my old High School a few years ago. There immortalized on the walls of the gym are the names of the “Wrestling State Champions” since it was founded. My high school was built around the 1960’s so it has now stood for some 50 years. As I gazed at the wall, there were only four names of young men who had earned a state title in all that time. One of them was my old friend Loran. It was years after graduating from high school that I came to recognize that I had been the recipient of “the company that I keep”. Wrestling with Loran everyday had brought out the best in me. He had made me try harder by encouraging me to sharpen my skills, molding me into a champion I would become that senior year. We need to keep our life in order, so that we can “keep the company” of men and women that will bless, uplift, and ultimately help us become the champions of our Savior.